Popular podiatry clinic opens 7th South Florida foot care location. We are so pleased to be able to reach more patients in the Boynton Beach area with the opening of our new office space. The doctors and staff at South Florida Foot & Ankle Centers are pleased to announce the opening of a brand new podiatrist office in Boynton Beach, Florida. This will be the 7th South Florida podiatry office in Palm Beach County, which provides convenience for patients in need of podiatry services. The other podiatrist offices are located in Royal Palm Beach, Lake Worth, Palm Beach Gardens, Belle Glade, Port Saint Lucie, and West Palm Beach. The Boynton Beach office hours will be Mondays from 9am to 5pm and Wednesdays from 8am to 11:30am. The office is located at 6699 West Boynton Beach Blvd. #B, Boynton Beach, FL 33437. The podiatry practice includes Dr. Jonathan Cutler, DPM, Dr. Brett Fried, DPM, Dr. Joshua P. Daly, DPM, MBA, and Dr. Jennifer Kazamias, DPM, who are all Doctors of Podiatric Medicine. They each specialize in different fields of podiatry encompassing sports injuries, diabetic foot disorders, and foot and ankle pain. They provide a variety of treatments for patients in South Florida such as PRP therapy, laser toenail treatment for fungus, varicose vein removal, and much more. “We are so pleased to be able to reach more patients in the Boynton Beach area with the opening of our new office space,” said Dr. Jonathan Cutler of the new office opening. 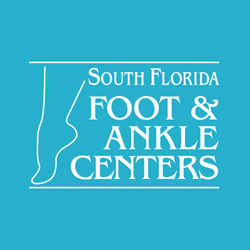 The doctors of South Florida Foot & Ankle Centers are known for their clinical expertise and the ability to make patients feel comfortable during office visits. “This is achieved by educating our patients and working with them to develop a plan of care and work towards a common goal of overall foot and ankle health,” adds Dr. Cutler. The doctors have experience in a wide range of podiatry treatment areas that caters to the diverse South Florida community. One such area of expertise is in elder care since that is a large portion of the South Florida community. They are very familiar with treating patients that are dealing with mobility issues, pain, swelling, corns, bunions, and other foot ailments that often affect the elderly. Another problem for residents in humid South Florida is foot and toenail fungus. Laser treatments for fungus removal and other safe treatment options are available. Diabetic foot care is another area of expertise for the podiatrists at South Florida Foot & Ankle Centers. Areas in South Florida like Boynton Beach are also home to a very active community of runners, swimmers, and athletes; the podiatrists are well versed in treating sports injuries that affect the feet and ankles. With podiatry centers located in Royal Palm Beach, Palm Beach Gardens, Lake Worth, Belle Glade, Port St. Lucie, Boynton Beach, and West Palm Beach, South Florida Foot & Ankle Centers serves to meet the needs of those with foot and ankle conditions. The doctors at our centers provide an excellent level of care and compassion. Our podiatrists will work with patients to understand their needs and provide optimal treatment for their foot and ankle issues. For more information, visit http://www.wcfoot.com or call 561-674-0747 to schedule an appointment today.